We link the corporate governance literature in financial economics to the agency cost perspective of corporate social responsibility (CSR) to derive theoretical predictions about the relationship between corporate governance and the existence of executive compensation incentives for CSR. We test our predictions using novel executive compensation contract data, and find that firms with more shareholder-friendly corporate governance are more likely to provide compensation to executives linked to firm social performance outcomes. Also, providing executives with direct incentives for CSR is an effective tool to increase firm social performance. 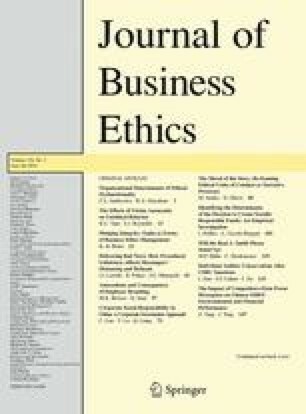 The findings provide evidence identifying corporate governance as a determinant of managerial incentives for social performance, and suggest that CSR activities are more likely to be beneficial to shareholders, as opposed to an agency cost. For example, as discussed in its Proxy Statement, the Kellogg Company divided its Annual Incentive Plan for its CEO John Bryant into financial and non-financial incentives: “90 % of the annual incentive opportunity was based on performance against corporate financial metrics…and 10 % was based on performance against non-financial targets (people safety, food safety and quality, and diversity and inclusion).” Thus, John Bryant of Kellogg is coded as being offered CSR-linked incentives. The compensation plans typically contract on a dimension of social performance with symmetric consequences. For example, one common area of contracting is Employee Diversity and Inclusion. In principle, a CEO could be credited for doing well, poorly or both well and poorly on this dimension. For an example of the latter, the firm may experience an increase in promotions for women but a reduction in promotions for minorities. In this setting, the CEO’s compensation would be based on the net results of these “strengths” and “concerns.” Additionally, the CSR performance compensation payment is usually based on the net result of “strengths” and “concerns” across multiple categories. Hence, it could be that a given category of CSR compensation contains only “strengths” or “concerns.” Nonetheless, the final payment to the CEO is based on the net result of all of the categories, which mirrors our empirical analysis. McGraw Hill Financial. (2015). http://us.spindices.com/indices/equity/sp-500. Accessed 15 November 2015. The UN Global Compact-Accenture CEO Study on Sustainability. (2013). http://www.accenture.com/SiteCollectionDocuments/PDF/Accenture-UN-Global-Compact-Acn-CEO-Study-Sustainability-2013.pdf. Accessed 9 May 2015.